ECHS cleans hotels and timeshare resorts across the East Coast and the Midlands, and has a growing footprint in Gauteng, Mpumalanga and Limpopo. The company, now a brand within Tsebo Cleaning Services was founded by Kim Castleman, who had a vision to provide the end user with a more personalised service and greater attention to detail. That vision has stood ECHS well – helping it grow from humble beginnings with just four contracts into a large organisation employing up to 800 people. The team at Tsebo Cleaning KZN share Kim’s passion and work ethic – making them a powerful and empowered team. Kim believes strongly that in order to provide a truly great service, the service must be personalised. Our cleaners add the shine! Housekeeping and cleaning is tiring work, yet many Cleaners in the industry never get recognised. So Tsebo Cleaners – we just want you to know that you are greatly appreciated by management and staff, our clients and visitors to the sites we service. Your work is very important: an effective housekeeping team does so much to influence people’s perceptions, positively or negatively, about the hospitals, office blocks or buildings they frequent. When someone is admitted into hospital having a clean, hygienic room means a lot to them. When someone comes to work in the morning and their working area is clean and fresh – it just starts their day off in a great way. And don’t forget the warm, friendly and professional approach of our cleaners, in dealings with staff or customers. It adds happiness to the ‘shine’ that’s evident wherever Tsebo Cleaners work. Tsebo Cleaners – thank you. 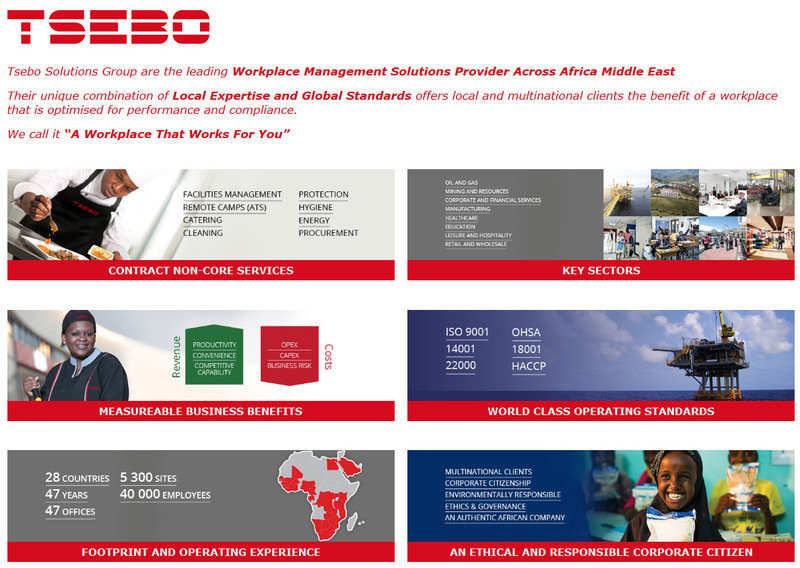 Welcome to our newsletter; a platform for us to share our experiences and successes with our staff, the rest of Tsebo Outsourcing Group and our clients. As the fastest growing national contract cleaner, our combination of Tsebo Group’s strategic procurement and investment in staff together with innovative technology, allows Tsebo Cleaning Services to meet the needs of diverse client sites, from hospitals to business parks and malls. Our clients enjoy competitive value for money. Their investment secures a response-orientated service and the highest quality standards. In taking, very seriously, the levels of cleanliness and hygiene expected on-site, our people go beyond the expected to deliver that visible ‘shine’ that is the hallmark of a truly cleansed and refreshed environment.